2) style of event, it is Christian or Secular, is the target audience youth, all ages, retired folk, church-friendly people, seekers, non-churched… etc. In one sense it doesn’t matter because I have done all of these sorts of events but you do approach them differently and it may affect how you set up. 3) style of music, it helps to know more than just whether you are VJing for a DJ-set or providing ambient visuals for some acoustic-ballads. Ideally you would be familiar with the band(s), in this case Michael kindly sent me all the lyrics which was good because I could have a think about what visuals to use even though I had no idea of the pace of any music. 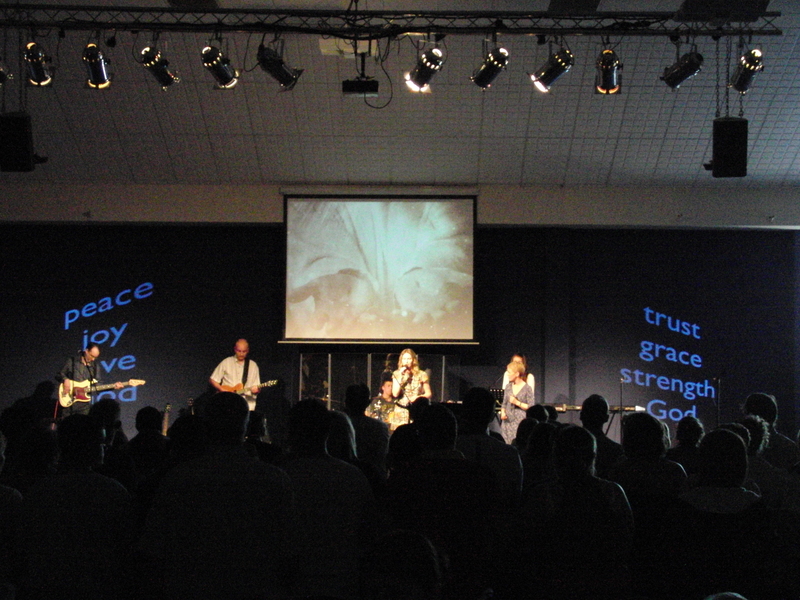 Physical Setup: Elim has a single central screen behind the band and the wall behind the stage has dark paint. The wall also isn’t flat but has some structural elements. With no access to rear project and not easy to project ‘through’ the musicians – I knew I wouldn’t be able to do a contiguous dual or triple head set up to give one wide image. However, I decided to take two projectors and off set them wide on either side of the stage – skewing the image at a distorted angle. I like this sort of ‘wall painting’ where the images don’t have to match. Mixing: as mentioned, I had been sent the running orders of the three bands, but only the evening before this event, and other than the odd worship song I didn’t know what they would sound like. I also made a mistake in copying these from email and mixed them up a bit which didn’t help (don’t rush things before you leave work for the day). However, I read through them and made some notes, for example one song by Ranan was called ‘Walls’ and had that sort of obvious theme. I didn’t have anything specific that would fit but did have a high quality still of a brick wall so made a quick scrolling video from that. Once I heard the song I found it was a bit too fast but I was able to slow it in playback, it didn’t look too cheesy so I went for it and it did seem to have a good impact. There was another song by Michael Trotter, which brought to mind a video I have in black and white of someone on a swing. It’s down beat, thoughtful, a bit sad and the lyrics were about praying for people so I thought is might work. If the song had turned out to be fast it wouldn’t have worked but as it was I think it worked well and I put the same video looping on all three projectors (using channels 6, 5 &4) as shown due to the dark walls and distorted position of the side projectors it might not have been able to see what was happening if the same image wasn’t on the center screen. Another moment when this worked really well was an idea I had on the night just before Michael Trotter went on. It was to have the word ‘Praise’ animated to appear then fade and zoom toward the viewer, because I saw a song that had the word ‘Praise’ in it allot. When it came to that song I was able to trigger that animation each time the word was used – it filled the middle screen then expanded off towards the viewer filling both side screens. Those were a couple of moments that I think worked really well, although I did get a lot of feedback from people there which seemed to indicate that things were working.. in particular adding something to the event and not detracting from what was going on. Overall: Whenever I’m involved in visuals for a service and in particular worship VJing a great deal of what I do happens in the moment. There is a balance to keep between being prepared – in this case reading through the lyrics – and reacting to the flow of what God is doing as it happens. For this event I am happy that I got the balance right by having some ideas before hand and enough of a ‘pallet’ of videos to get me through the night. Several things came to me spontaneously, which is when I know God’s in charge, and the feedback at the end of the evening was very positive (in fact there were so many people commenting how much the visuals added I felt very affirmed in this ministry). 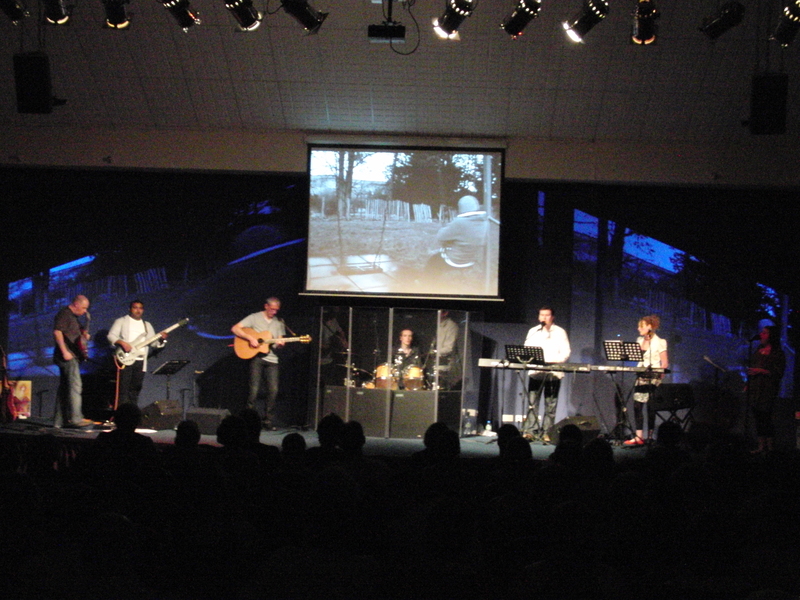 This entry was posted in case study, Christian Worship, GrandVJ, Uncategorized, Visuals in Worship. Bookmark the permalink.